SEOUL, Feb. 7 (Yonhap) -- South Korea's human rights watchdog on Thursday asked a media regulation agency to address gender inequality on the boards of broadcasting and communications regulatory bodies and television programs. The National Human Rights Commission of Korea (NHRCK) said it has asked the chief of the Korea Communications Commission (KCC) to revise the current law to ensure that a particular gender does not exceed 60 percent of board positions at the KCC, the Korea Communications Standards Commission (KCSC) and public broadcasters. The NHRCK also recommended that the KCC add gender equality to its broadcasting evaluation criteria and create a special subcommittee on gender equality. Officials at the NHRCK said the recommendation is aimed at preventing the spread of gender stereotypes through broadcasting and promoting gender equality in the broadcasting policy-making process. As of now, all five standing commissioners of the KCC are male, while men account for six of nine KCSC commissioners. 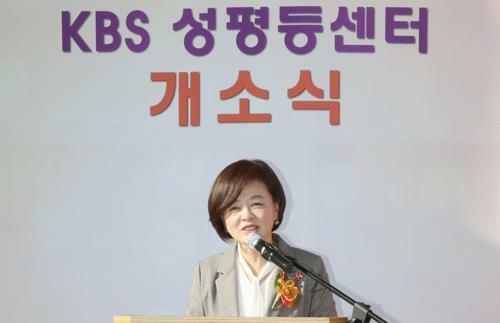 At public broadcaster KBS, nine of 11 board members are male. According to the NHRCK's study on gender equality in the media, conducted in 2017, male characters in television dramas are most often in positions to make decisions while female characters usually play the secondary role of following men's instructions. Indeed, men accounted for 47 percent of professional drama characters, such as company president, lawmaker and doctor, compared with 21.1 percent for women. By contrast, women accounted for 50.6 percent of drama characters depicted as unemployed, low-ranking or non-regular workers, compared with 35 percent for men. In the case of TV news programs, female anchors mainly introduce soft news, while male anchors tend to deal with comparatively heavy topics, such as politics and national defense. On current affairs talk show programs, men accounted for 90 percent of moderators, while women accounted for only 10.6 percent of current affairs talk show guests. NHRCK officials said the preponderance of men on current affairs talk show programs is feared to reinforce the stereotype that men are largely responsible for political, current and social issues.